As a powerful DSL modem router, the Archer VR2800 supports super fast VDSL or ADSL broadband of up to 100Mbps, as well a variety of other connection types. The LAN/WAN port accepts connections from Cable Modem or Fiber Modem, and both of the two USB 3.0 ports support 3G/4G dongle connections for a perfect main or backup internet connection. The Archer VR2800 adds a dedicated processor for each band to manage Wi-Fi traffic, freeing up the router's 1GHz dual-core CPU to tackle more consuming tasks. MU-MIMO MU-MIMO technology serves several devices at once, reducing wait time, increasing Wi-Fi throughput for every device, and making each stream more efficient. Versatile connectivity As a powerful DSL modem router, the Archer VR2800 supports super fast VDSL or ADSL broadband, as well a variety of other connection types. The LAN/WAN port accepts connections from cable modem or fiber modem, and both of the USB 3.0 ports support 3G/4G dongle connections for a perfect main or backup internet connection. Wi-Fi with Beamforming Beamforming technology locates the connected devices and further improves the Archer VR2800's range and the signal strength to each mobile device, delivering a more reliable and efficient wireless connection. Simultaneous dual band Separate Wi-Fi bands enable more devices to connect to your network without a drop in performance. 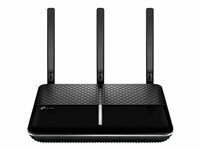 The Archer VR900 is an integrated DSL modem router that works with any kind of Internet connection, including VDSL, VDSL2, ADSL, ADSL2, and ADSL2+. With the Gigabit Ethernet WAN option, the Archer VR900 can also be used with any fiber broadband or cable modem with an Ethernet output. While the DSL and Ethernet WAN inputs provide universal compatibility with any Internet service, both of the USB ports also support 3G/4G dongle connections. This universal router gives you the flexibility to keep your current ISP or change ISPs in the future, without compromising wireless performance. Superfast broadband speeds and superfast Wi-Fi speeds The Archer VR900 features superfast broadband speeds of up to 100Mbps and supports VDSL2, as well as backward compatibility with ADSL2+/ADSL2/ADSL. Better coverage and a more stable connection Three external antennas help the Archer VR900 provide stable coverage throughout your entire home and property. Advanced Beamforming technology automatically locates wireless devices and forms targeted, highly efficient wireless connections. High performance antennas The Archer VR900 features three specially-designed, detachable antennas. The antennas boast gains of 3x2 dBi on the 2.4GHz band and 3x3dBi on the 5GHz band, ensuring both stability and reach. All three are completely adjustable to ensure optimal orientation and provide you with great Wi-Fi performance. Powerful processor for enhanced performance The powerful, 1GHz dual-core Broadcom processor boosts speeds and ensures that performance is never compromised even while simultaneously processing multiple wireless and/or wired tasks. Let the processor handle your busy network while you enjoy a hassle-free, connected life. Fast USB sharing With USB 3.0 and 2.0 ports, you can easily access and share a local printer, a local network drive, or a remote FTP server. Storing, accessing, and sharing files and media has never been easier. Gigabit wired connection With four built-in Gigabit Ethernet ports, the Archer VR900 is capable of providing the stable, ultra-fast wired connections that you need to ensure lag-free gaming and uninterrupted HD video streaming. Elegant appearance The sophisticated design enhances every home. Its gentle curves, excellent crafting and remarkable quality exudes style and elegance without compromising on performance. Easy setup and use The Archer VR900's powerful web interface allows it to be set up and configured in a matter of minutes. The intuitive design allows users to easily monitor and personalize settings for a wide range of functions including guest networks and parental controls. Superfast VDSL broadband The advanced VDSL2 technology allows the Archer VR600 to deliver impressive VDSL broadband speeds. The Archer VR600 serves as a DSL modem and wireless router, combining two devices in one. The integrated DSL port supports all standard DSL connections. Versatile connectivity With multiple inputs, the Archer VR600 provides you with a variety of functions, when connecting to the Internet. As a backup, the EWAN port allows the Archer VR600 to accept connections from cable and fiber modems via Ethernet cable. Additionally, both of the two USB ports support 3G/4G dongle connections. Superior range and stability High-performance external antennas help the Archer VR600 create an expansive home network. Advanced Beamforming technology automatically locates wireless devices and forms targeted, highly efficient wireless connections. Blazing fast wired performance To help your wired devices achieve peak performance, the router's Gigabit Ethernet ports operate faster. Connecting an external drive to one of the USB 2.0 ports allows you to share files, photos, music, and video with any device on the network. Superfast Wi-Fi - Up to 1.2Gbps The Archer VR400 unlocks the full potential of your internet connection by providing combined dual band Wi-Fi speeds of up to 1.2Gbps, including 300Mbps on the 2.4GHz band and 867Mbps on the 5GHz band, eliminating lag and buffering from your online experience. Superfast VDSL Broadband The latest VDSL2 technology allows the Archer VR400 to deliver impressive VDSL broadband speeds of up to 100Mbps, which is almost five times faster than ADSL2+. 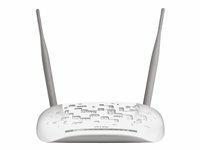 The Archer VR400 serves as a DSL modem and wireless router, combining two devices in one. The integrated DSL port supports all standard DSL connections, including VDSL2, ADSL2+, ADSL2, and ADSL. Versatile Backup Connectivity With multiple inputs, the Archer VR400 provides you with a variety of options when connecting to the Internet. As a backup, the EWAN port allows the Archer VR400 to accept connections from cable and fibre modems via Ethernet cable. Additionally, the USB port supports 3G/4G dongle connections. Blazing Fast Wired Performance To help your wired devices achieve peak performance, the router’s Gigabit Ethernet port operate 10x faster than standard Ethernet. Connecting an external drive to the USB 2.0 port allows you to share files, photos, music, and video with any device on the network. Easy Setup and Use Set up the Archer VR400 in minutes thanks to its intuitive web interface and the powerful Tether app. Tether also lets you manage its network settings from any Android or iOS device, including parental controls and media sharing. 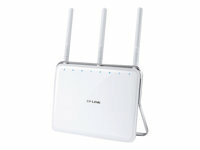 One-stop solution The TD-W8961N does the work of several networking devices packed into one sleek device. With an ADSL2+ modem, NAT router, 4-port switch and 300 Mbps wireless N access point, this device eliminates the need to purchase multiple devices to access and share a high-speed Internet connection. 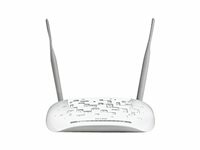 Incredible wireless performance With 300 Mbps 802.11n wireless and 4 Megabit LAN ports, the TD-W8961N is the ideal choice for bandwidth heavy users that rely on speedy, reliable connections for bandwidth intensive work or entertainment such as lag-free conference calls, HD video streaming or online gaming. Ideal for multimedia application Port VLAN binds specific LAN ports and PVCs for differential services like IPTV. The TD-W8961N's built-in QoS engine provides various QoS policies that help prioritize Internet traffic to enable smooth IPTV streaming and lag-free online gaming. Thus users can experience the benefits of a smooth network connection without worrying about traffic congestion. Combined with IGMP multicast and IGMP snooping features the TD-W8961N makes an ideal solution for multimedia applications. Advanced network security and flexible management The TD-W8961N utilizes NAT and SPI (stateful packet inspection) firewalls which inspect the contents of incoming packets before they are allowed in, preventing potential attacks from across the Internet. For added convenience, it supports access control based on Mac addresses, IP addresses, domain names or applications such as MSN or Yahoo Messenger, so that parents and network administrators can establish restricted access policies for children or staff. Aside from web configuration, the TD-W8961N also provides TR-069 and SNMP, which automatically update the device's firmware and other settings when they become available from users' ISP. All of these features help users to enhance their network's security and make network management more flexible. WPS one button security To set up their network's security encryption, users need simply to press the WPS button on their TD-W8961N, then push the WPS button or enter the router's PIN code in the wireless client, and it will automatically establish a WPA secure connection. Not only is this faster than normal security setups but more convenient in that users don't need to remember a password! Easy to use Even novice users can easily setup their networking products. The device comes with a CD with an easy sSetup assistant that leads you through the setup process step-by-step, and even helps with wireless network settings and security configurations.